Summer finally arrived and boy is it hot. It goes from bearable to extreme making “computing” less fun. Today is one of the “cold” days so time to get something on “paper”. Besides this I will get some programming work done and play some classic Amiga games with hopefully a bit of time to write a review. Something I did try in the last couple of time was Qt 4.7. It was a real struggle to get it installed. The biggest problem was to get in on to my Amiga. I tried to download it first but OWB froze all the time not capable of getting the full file which was 400+ MB in size. NetSurf did get it in one time but the file was corrupt. Tried it twice if I remember correctly but both times I ended up with a corrupt file. Next up was a FTP transfer and I tried it with the Amiga as a server and my laptop with Windows 8 as a server bot no matter which setup it did not work. Either it froze every time after a few seconds or it kept going for a bit longer till it also froze. With the resume option I could continue and with one setup I did manage to get to the 400+ MB size but it kept going and going reaching over 500+ MB which meant this was not going to work. Next up was DVD transfer and even with two rewrite-able’s I still got a corrupt file error. After doing a bit of searching I came across FTPMount which allowed me to transfer the whole file without ending up being corrupt. What a great tool this is. I use it with the CLI (old school style) and I was really impressed. I will try it a bit more transferring large files to see if it was not a lucky moment I had with Qt. So how is Qt4.7? I don’t like one bit. I expected this already but it is a resource hungry program. So most Qt programs will not run. The ones that do are sluggish and they look messed up. It is hard to explain but it is like you see two windows. 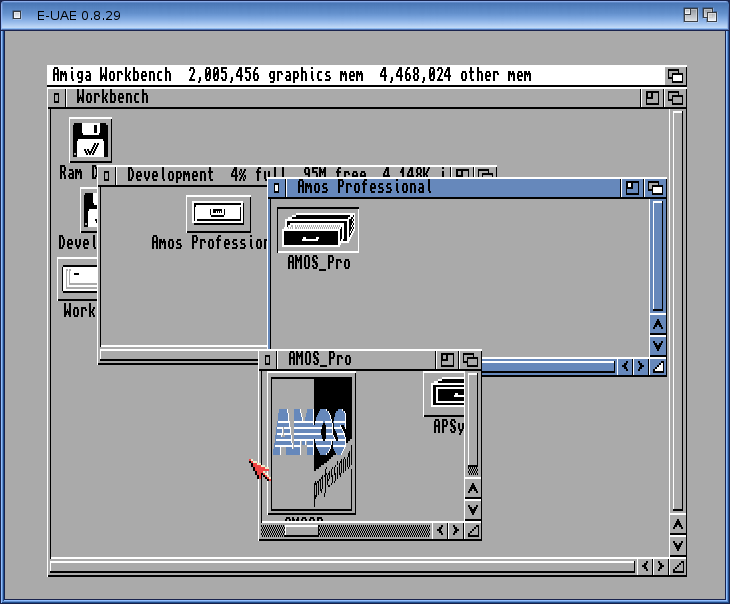 It is like the programs window is displayed in a OS4.x window so you see the outer parts of the OS4.x window around the Qt window. Of course I only use 128 MB of memory so I should not expect a lot. At least I had a try and I got to know FTPMount so it was not completely fruitless. There is one topic I am really interested in and that is having a Basic programming language on OS4.x. I grew up with Amos and I always have had a love for Basic like languages. There have been attempts to get a Basic language on to the OS4.x platform while also targeting other platforms at the same time. None of them never really amounted to anything. We can debate if such a language is really needed let alone the time that is needed to get it done. There is Hollywood, the easy to use “program language” so in a away that area is covered for OS4.x. I never used Hollywood myself so I can’t make any comments on it at all. But wouldn’t it be great if there was a Amos like Basic language on OS4.x? A simple way of programming difficult programs, games, demos etc. while still learning the art of programming? No drag and drop but writing the code yourself yet shielding you from the bits that would make you normally scream and run away. I guess that would be really cool. What are the chances of something like this ever to appear on OS4.x? About zero I would say. I thought about it often if I should not have a try myself. I know more about cars than about creating a Basic program language and I don’t know anything about cars. None the less I have decided to dive into this to see what I am capable of and how far I would get. This is really a starting from scratch, or struggling if you like, project with epic fail written all over it. I will be writing about it in detail so you all get to learn something. If it fails I at least give it a try instead of only thinking about it without actually doing anything. Here’s to the mess I probably will get myself into.